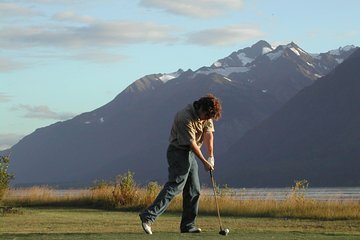 Golf with stunning views of mountains, glaciers, rivers, waterfalls, and more. Travel from Skagway to Haines by high-speed catamaran. Tour Fort Seward before heading to the golf course to collect your clubs, pull-cart, balls, and shoes. Spend 2.5 hours on this scenic 9-hole course, stopping to admire eagles, moose, mink, and otters. End with a delicious snack of smoked salmon before your return to Skagway. This golf course is so beautiful! The owner is there and his story is so interesting too. Glad we booked this! We had a personal tour guide that drove us around and showed us Haines AK and the Brewery was another highlight at the end of the day!